When you need to get your workers and all their kit to, from or around site, you can’t go past the functionality of a dual cab ute. At Rentco, we pride ourselves in having the best quality fleet of dual cab rental vehicles on the market, and they’re backed by a 24/7 national breakdown support service. Because mine sites in Australia often operate in extreme weather conditions, they’re some of the toughest workplaces in the world. Plus, mine sites are often many kilometres from the nearest town. This makes transporting staff to and from site challenging, especially in areas where roads are unsealed or at best rough. This is why reliable transport which is covered by the support of a local company with national outreach is vital. 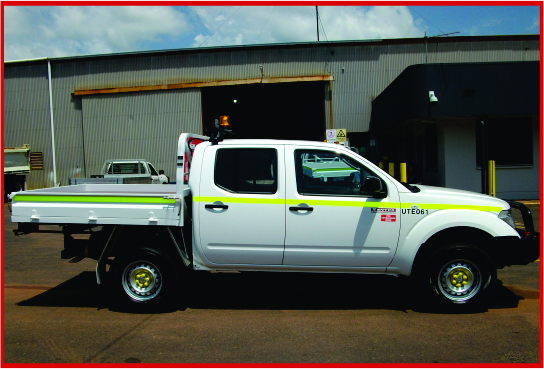 Our dual cab hire utes can seat up to 5 passengers safely. Before you pick them up, every vehicle undergoes a multipoint safety check so they’re inspected, fuelled up, and ready to work! Sometimes getting your crew to the site or moving them from one site to another can be a nightmare. This is especially true when so many constructions sites are in the inner city or built up areas with restricted access to parking. So whether you need to get a team to the site or move them across town, whatever the reason, hiring a Nissan Navara dual cab ute is a sensible solution. Our dual cab hire utes mean you can transport 5 tradies and their kit from one place to another quickly and safely. With its generous cargo space, there’s room for supplies and all the tools of the trade. Plus, some models have the capacity to tow a trailer. Rentco customers benefit from local accessibility with the bonus of 24/7 national breakdown support service at no extra cost. So, you get the best of both worlds, access to a major fleet, local knowledge and national outreach. Our modern fleet of well-maintained duel cab utes are available for long or short them hire from our outlets in Perth, Adelaide, Melbourne, Sydney, Brisbane, Townsville and Darwin. Need a dual cab ute in Perth talk to us. In fact, for dual cab ute hire anywhere in Australia, Rentco has you covered.